Fifteen Means of Transport. | china-land. -Four days spent in another province/another city — Guilin. Guilin is ~350 miles from Shenzhen. Two days were spent on transportation alone. 1. Shenzhen – Guilin: We arrived at our bus station twenty minutes before departure–8:20PM. We booked a sleeper bus. We: Sarah, Christy, and me, the lone foreigners, in a gaggle of well over 500 or more migrants/people– loaded down with gifts, luggage and other necessities. No idea where to go –a guard took charge and cut a path through the horde. Eventually we found our steed and left the station by 9:15PM. It was not a sleeper, though we paid for one. 2AM — Our bus was at a turtle’s pace, slow-moving-standstill. Bumper-to-bumper, in the middle of China. Welcome to Holidays in China. 2. 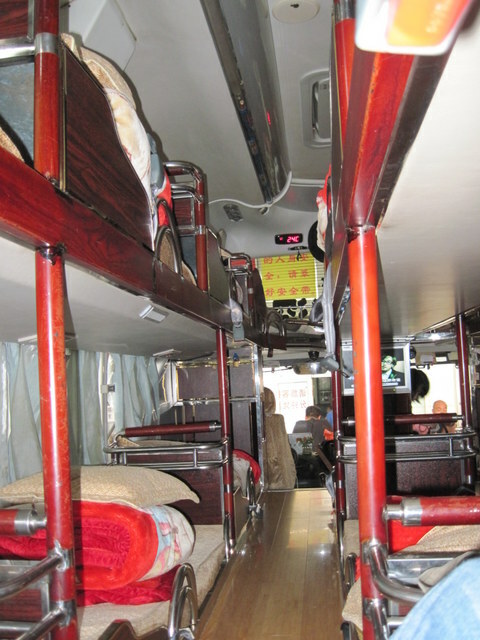 Guilin-Guilin –this was a city bus taken to go visit our host–Daniel’s, sister for lunch. Took one hour to get across Guilin’s city. Welcome to Holidays in China. 3. Guilin-Jiao Jiao — 2PM ‘We’re somewhere over the rainbow.’ I will never forget the faces. Faces paralyzed my eyes with their stare. These were not city faces. These were faces who worked hard for this bus ride, worked hard for the seat they sat in, did not shield their skin with heavy layers or open umbrellas to block the sun. These faces welcomed us the most I’ve ever been welcome in China. The bus moved slowly out of the city, picking up stragglers, propping stools in the aisle for latecomers. 4. Jiao Jiao-Gulin — 8AM The same bus, only in the morning. Back into the city from the village. Somehow a chicken got on board as well. We’d jolt awake from an occasional clucking. Our bus sat in a village’s center for thirty minutes. Directly off the bus was an orange seller. I bought nine oranges for .50 Cents. ‘We must be over the rainbow!’ Welcome to the Village. 5. Guilin-Guilin — 12:30PM, city bus to Yiwu Road. This road held our housing for the night. First person I asked didn’t know what road it was, so we found it by way of the bus. Arrival on the road–a person said, there are no numbers and couldn’t locate where ‘number 2’ was. We walked almost the entirety and found the hostel without anyone’s help but ourselves. 6. Guilin-Yangdi — 10AM, a tour we signed up for. The bus left at 10AM but proceeded to sit stationary for ~45 minutes. What was supposed to be a one our trip lasted four hours in bumper-to-bumper/standstill traffic. This bus was almost all young rowdy foreigners–who did nothing but aggravate our brow. 7. 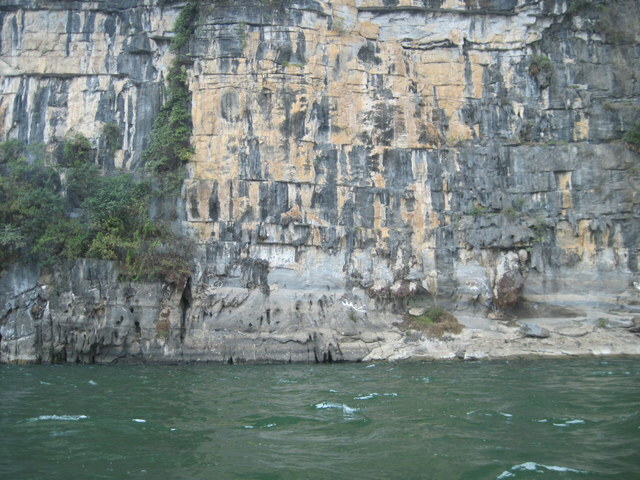 Yangdi-XingPing — 2PM, a motor-bamboo-raft-boat tour. 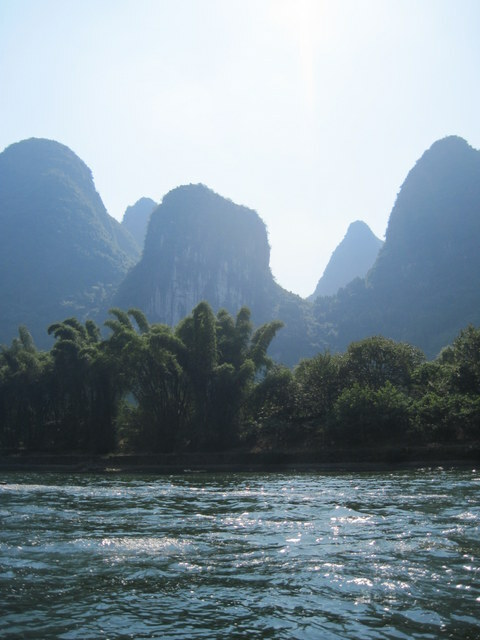 We sailed along the Li River. The sun was at its zenith with the rays playing upon the water and fresh air kissing my cheeks. Egrets bounded and zipped between riverside cliffs. 8. Yangdi-Yulong River — 4:30PM, On the bus ride our tour guide sweet-talked us into a ‘real bamboo raft’ ride. It included a bird show and petting water buffalo. Christy and I did this tour two years ago and it was romantic, gorgeous, and slow. It took about 1.5 hours two years ago. That was two years ago. This tour and the town inhabiting this boat vomited tourism all over itself. It was full of vendors and had ten times more boats than before. Sarah and I balanced onto the boat and sat–for twenty minutes. We went down a rapid, had our picture taken, came back up and it was over. No bird show, no petting wild water cows — Nothing. 9. Yulong River-Yangshuo — 6:30PM, meanwhile back on the bus I got the bright idea to call our hostel to make sure where they were located in Yangshuo. I called and they said, ‘no, we are in XingPing, and the last bus leaves at 7PM.’ We were 45 minutes-an hour away, there was no way we would get there in time. Yangshuo: Sarah and I arrived and decided to take our time before finding a means of transport to XingPing from Yangshuo — about 30 KM away. All of humanity enveloped every possible area in the crowded main street of Yangshuo. It made Yangshuo no longer whimsical and appealing as it once seemed. Again tourism had vomited all over itself. We checked four different tour agents to get us a taxi out to XingPing–all different prices. Some 30 USD, some 40 USD, some 50 USD. We ran out of options on our fourth try. We settled on 30 USD from our savior: Dragon. 10. Yangshuo-XingPing — 8:30PM, EXODUS: Dragon rescued us, he called motorcycles to carry us through the crowd, got license plates, gave us his phone number, and off we went to some location for the private car, ready to drive us 30 KM. The motorcycles paved the path through mounds of tourists. I felt like the biggest jerk for riding on the back of a motorcycle–honking and [almost] grazing over people. Sarah and I reunited at our private car and off we went. Private Car: The spookiest ride yet, in the pitch black– through bumpy, broken, dirt roads. Sarah and I were happy we organized this through Dragon. Had we asked a taxi ourself we would have thought he was taking us out back to beat us and rob us blind. XingPing was a sleepy quiet town. 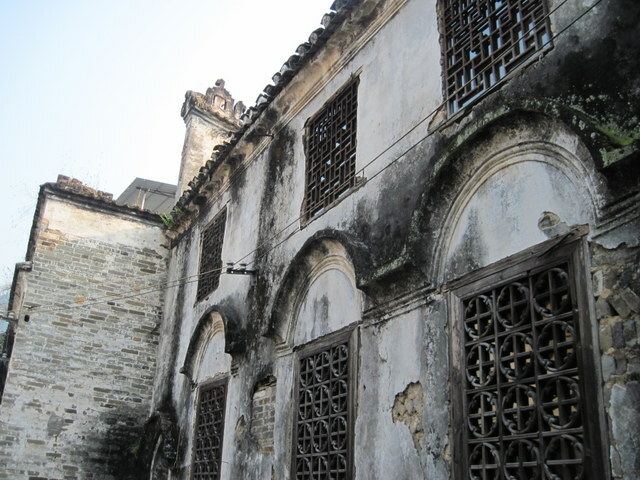 ~300 years old and a well worth stay, over Yangshuo. 11. XingPing-Yangshuo — 9:40AM, after a thorough walk through XingPing we bounded a bus headed for Yangshuo. 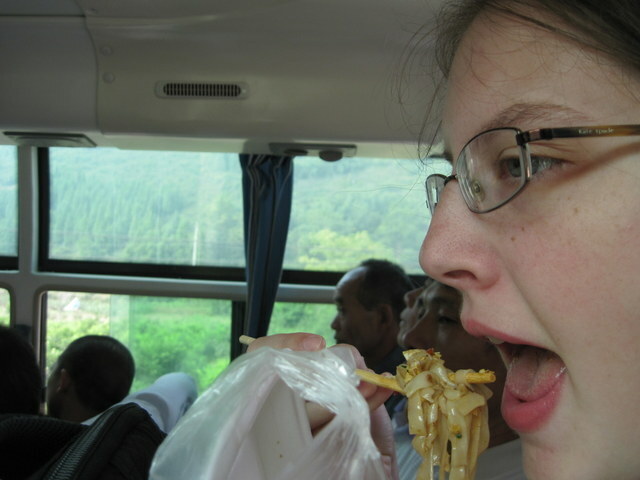 We took our noodles and thought we’d be inconspicuous, later realizing there’s no need to hide our food. No chickens on this bus, but next to Sarah, sat, three grumpy old men cackling slurs at us. We endured. Sarah and I obliged the offering of old man motorcyclist wearing a helmet. Two foreigners and a tiny Chinese man boppin’ down roads into traffic/oncoming traffic/cars/pedestrians/bicycles/tricycles and more. We arrived unscathed and once again, praised the Gods, and professed we would never again ride motorcycles. 13. Yangshuo-Guilin — 11AM, the last bus to take us 60 KM back to the main city, back to Shenzhen. We boarded and drifted to sleep. Of course the last bus took only one hour. 14. Guilin-Guilin — 12PM, tricycle. Sarah and I decided we wanted to enjoy a tricycle ride one last time before heading back to Shenzhen. We wanted hair washes [3 USD for your hair washed and a back massage] before our ~15 hour bus ride back to civilization [ShenZhen]. We found our tricycle man to which he promptly pedaled us directly across the street. We laughed at our foolishness and paid. 15. Guilin-Shenzhen — 6PM, Alas! Our ticket out of Bus Purgatory by way of sleeper bus. This time it really was a sleeper bus. Sarah and I were thrilled. After ‘bojangling’ around Guilin for two hours [dropping goods off to various vendors, picking up strays to sleep in the aisle] we got moving. Three hours later Sarah punched me awake. Right between the two of us perforating our nostrils was vomit in the aisle. ~45 hours of transportation in the span of four days. Welcome to Holidays in China! This entry was posted in Uncategorized and tagged bamboo raft, Chinese transportation, Guilin, ShenZhen, travel, village, XingPing, yangshuo. Bookmark the permalink.